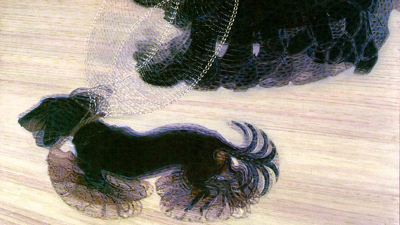 “Dynamism of a Dog on a Leash” by Giacomo Balla, 1912. As a child I was given a book called The Enchanted World, it was an eclectic collection of artists and the results of their imaginations. The painting above and the lion from Alexander Calder’s circus were the two images I loved the most. I think in observing this image, I had my first understanding of how time worked and how it could be represented visually. The animator in me still loves this painting. This entry was posted in Art and tagged animation, enthusiasm, foreign world, imagination. Bookmark the permalink.